Couldn't find another thread on this, so just yell at me if I failed at searching. Anyway, http://metroidconstruction.com/hack.php?id=357 . Basically "a door randomizer and a scoreboard (that even accounts for slick gameplay)", as aptly described by a reviewer. Will cause you to hate specific rooms in Super Metroid, and generally live in fear of crabs. Came out December 31, 1969 sometime in 2017 I think. I recently started playing this too much. * What is Time Attack? You start off with 3 minutes on the clock. Time starts counting down starting with your second room, excluding boss rooms. You get extra time (amount based on difficulty) every time you get 10000 points (and point values for doing things like killing enemies are adjusted based on difficulty selection. Have this setting off to be allowed to spend as much time as you want in a room, obviously. * What is Auto-refresh? This just means you automatically start with a fresh seed, randomly chosen, every time you start Insert Coin again. You don't get to see the seed before playing it. This is actually a separate categorization on the leaderboards, presumably to differentiate whether or not practicing a specific seed is possible to get a particular high score. You can manually re-randomize the seed by pressing Select, but you'll still be counted as Manual refresh unless you specifically enable this option. (I was stupid and got one of my scores counted as Manual for this reason. Oh well.) Manually editing the seed value will also automatically toggle this option off. Handy tip: Attached are screenshots of the two "sweet spots" for cheesing (and thus getting the No Damage bonus against) Bomb Torizo. I presume they're probably the same in the original game too, but I haven't gone and checked. In the first screenshot, you can be there or one pixel to the left; dunno of the wiggle room on the second position. Edit: I oops'd away the two screenshots I had uploaded, so here goes another post for those. Couldn't find another thread on this, so just yell at me if I failed at searching. Anyway, http://metroidconstruction.com/hack.php?id=357 . Basically "a door randomizer and a scoreboard (that even accounts for slick gameplay)", as aptly described by a reviewer. Will cause you to hate specific rooms in Super Metroid, and generally live in fear of crabs. Came out [s]December 31, 1969[/s] sometime in 2017 I think. I recently started playing this too much. A couple things that I didn't know as a newbie: * [b]What is Time Attack? [/b] You start off with 3 minutes on the clock. Time starts counting down starting with your second room, excluding boss rooms. You get extra time (amount based on difficulty) every time you get 10000 points (and point values for doing things like killing enemies are adjusted based on difficulty selection. Have this setting off to be allowed to spend as much time as you want in a room, obviously. * [b]What is Auto-refresh? [/b] This just means you automatically start with a fresh seed, randomly chosen, every time you [s]start[/s] Insert Coin again. You don't get to see the seed before playing it. This is actually a separate categorization on the [url=https://arcade.supermetroid.run/]leaderboards[/url], presumably to differentiate whether or not practicing a specific seed is possible to get a particular high score. You [i]can[/i] manually re-randomize the seed by pressing Select, but you'll still be counted as Manual refresh unless you specifically enable this option. (I was stupid and got one of my scores counted as Manual for this reason. Oh well.) Manually editing the seed value will also automatically toggle this option off. Handy tip: Attached are screenshots of the two "sweet spots" for cheesing (and thus getting the No Damage bonus against) Bomb Torizo. I presume they're probably the same in the original game too, but I haven't gone and checked. In the first screenshot, you can be there or one pixel to the left; dunno of the wiggle room on the second position. Edit: I oops'd away the two screenshots I had uploaded, so here goes another post for those. * on top of every Chozo statue's head I've found so far, EXCEPT the Charge Beam Chozo statue and the Bomb Torizo Chozo statue (though I haven't tried stepping there BEFORE it started transforming). So this works even for the Wrecked Ship E-tank Room (which I prefer calling the Chozo Swimming Pool). Getting the "Billy Mays" Missile after the Alpha Power Bomb will basically guarantee you hit its secret. * Pink Brinstar Hopper E-tank Room: Similarly, just behind the E-tank platform. * Waterway E-tank Room: Again, just behind the E-tank. * Crateria Power Bomb Room, or as I like to call it, the Crateria Acid Dragon Room: behind the power bomb expansion. * In every energy/missile recharge station, getting on the far side of the refill machine is a secret. This doesn't work for a room with both rechargers though. * Wrecked Ship West Super Room: The nook below the Super. * Bowling Alley Path: in the middle pit with the Choot. * Terminator Room (i.e. the big slope in Crateria) and Lower Mushrooms: step on top of any mushroom to get the bonus. Only one bonus per room instance. * Electric Death Room: the left dead-end just below the ceiling you can shoot out. * Red Fish Room (Maridia top escape to Red Brinstar): The bottom of the spawner pit. * Noob Bridge: the far corner of the alcove UNDER the bridge. Obviously faster when coming in from the right, or if you have speed booster. * Big Pink: the quickmorph passage just below the higher missile pack. * Glass Tunnel: Just under the left side of the top platform. * Post-Crocomire (i.e. pre-grapple) Shaft: right underneath the top ledge, like two blocks from the left wall. * Early Supers Room: get the Supers then fall down the resulting hole. * Defeating each boss with no damage gives the "NO DAMAGE" bonus. One possible bonus per boss instance. * There's also a "NO DAMAGE" bonus for getting through Tourian Escape Room 4 (the biggest and most complicated Tourian escape room) without taking damage. Good freakin' luck getting it if you enter it from the right without morph ball, though, because of that one pirate that shoots you in the face right as you enter. * "SMOOTH": Getting the Morph Ball without falling all the way to the ground first. Easiest way to do this is to wall-jump off the right wall, but there is a way to do this that's slightly faster and doesn't involve spin-jumping; I dunno how it works though. Apparently there's another "SMOOTH" bonus for getting out of the Etecoon shaft's PB alcove without falling into the shaft, by using a mockball? * "JUSTCHECKING": They took out the power-bomb access to the left side of the Morph Ball room. But they left this as an easter egg. Requires regular Bomb or Power Bomb before you get Morph Ball, so then you can lay a bomb at that wall and "just check" whether there's anything beyond it. * "CLEANSER": Defeat all the enemies in a room. The two rooms I've found so far that this works in are The Climb (i.e. the Metroid 1 escape shaft), and the Thread the Needle Room. * "ALCATRAZ": Do the Alcatraz escape. * "YOLO": charge up a shinespark then shinespark into the next room. Of course, you have no idea what the next room will be. But that's exactly the point. * "JUST POINTS" or something like that: Go all the way to the right in Below Botwoon Energy Tank. * "SKY RIDER": ride the top Tripper at the very top of West Ocean to get that one Missile expansion. * "BLINDING": Defeat the Gadora in the pre-Kraid room. All other Gadoras seem to have been removed. * "LUXURY ITEM": Get the Spring Ball. * "THE LONG WAY": I think this is for getting to what would be the door to Wave Beam, without using Grapple (i.e. wall-jumping off the right wall of the spike pit before it). Not sure. * "PENALTY": heading into the fight against Mother Brain with an improper equipment loadout. See the readme for details. * "SURVIVOR": Survive for 100 rooms. Ones I haven't seen at all but we can probably guess what they are: "BABY SKIP", "GREEN GATE GLITCH", "SHORT CHARGE", "QUICK KILL" (presumably referring to Kraid), "FAST PILLAR", and maybe "EARLY SUPER". * The Plasma Climb is a giant pain, especially if you only have Power Beam. The reverse is easy as pie. * The Botwoon Energy Tank Room is doable without Gravity Suit. You'll need to quickmorph. Disabling Hi Jump Boots makes this easier. Also, the sand pits no longer drop you anywhere else. * Pre-activation ruined old Mother Brain room (or "Pit Room" as they call it, which is admittedly a faster name) doesn't have the Missile expansion. Only the activated version does. * X-Ray has been replaced by a Missile tank. * Crabs are among the most dangerous creatures you will ever encounter. Marine wildlife in general, actually. Do remember to keep a healthy respect for -- and a healthy distance from -- marine wildlife, whenever possible. Here we go: [url=https://s20.postimg.cc/lew5qa359/bombtorizo_sweetspot1.png]Sweet Spot 1[/url], [url=https://s20.postimg.cc/a2jk8i265/bombtorizo_sweetspot2.png]Sweet Spot 2[/url] Also since I'm posting here I might as well include a list of all the secrets I've found: [spoiler] * on top of every Chozo statue's head I've found so far, EXCEPT the Charge Beam Chozo statue and the Bomb Torizo Chozo statue (though I haven't tried stepping there BEFORE it started transforming). So this works even for the [url=https://wiki.supermetroid.run/Wrecked_Ship_Energy_Tank_Room]Wrecked Ship E-tank Room[/url] (which I prefer calling the Chozo Swimming Pool). Getting the "Billy Mays" Missile after the [url=https://wiki.supermetroid.run/Alpha_Power_Bomb_Room]Alpha Power Bomb[/url] will basically guarantee you hit its secret. 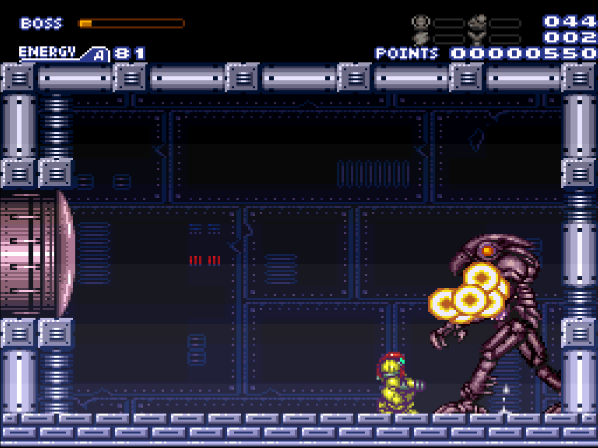 * [url=https://wiki.supermetroid.run/Hopper_Energy_Tank_Room]Pink Brinstar Hopper E-tank Room[/url]: Similarly, just behind the E-tank platform. * [url=https://wiki.supermetroid.run/Waterway_Energy_Tank_Room]Waterway E-tank Room[/url]: Again, just behind the E-tank. * [url=https://wiki.supermetroid.run/Crateria_Power_Bomb_Room]Crateria Power Bomb Room[/url], or as I like to call it, the Crateria Acid Dragon Room: behind the power bomb expansion. * In every energy/missile recharge station, getting on the far side of the refill machine is a secret. This doesn't work for a room with both rechargers though. * [url=https://wiki.supermetroid.run/Wrecked_Ship_West_Super_Room]Wrecked Ship West Super Room[/url]: The nook below the Super. * [url=https://wiki.supermetroid.run/Bowling_Alley_Path]Bowling Alley Path[/url]: in the middle pit with the Choot. * [url=https://wiki.supermetroid.run/Terminator_Room]Terminator Room[/url] (i.e. the big slope in Crateria) and [url=https://wiki.supermetroid.run/Lower_Mushrooms]Lower Mushrooms[/url]: step on top of any mushroom to get the bonus. Only one bonus per room instance. * [url=https://wiki.supermetroid.run/Electric_Death_Room]Electric Death Room[/url]: the left dead-end just below the ceiling you can shoot out. * [url=https://wiki.supermetroid.run/Red_Fish_Room]Red Fish Room[/url] (Maridia top escape to Red Brinstar): The bottom of the spawner pit. * [url=https://wiki.supermetroid.run/Noob_Bridge]Noob Bridge[/url]: the far corner of the alcove UNDER the bridge. Obviously faster when coming in from the right, or if you have speed booster. 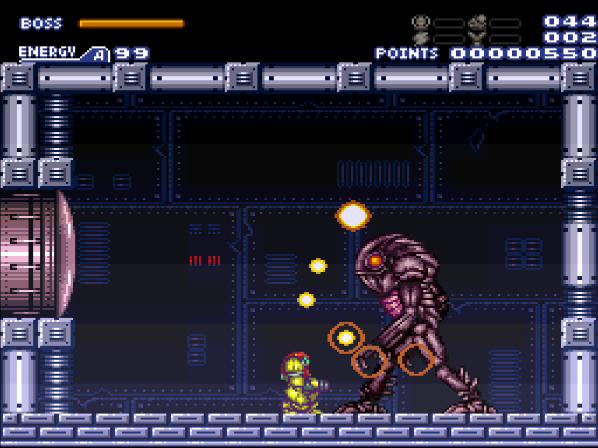 * [url=https://wiki.supermetroid.run/Big_Pink]Big Pink[/url]: the quickmorph passage just below the higher missile pack. * [url=https://wiki.supermetroid.run/Glass_Tunnel]Glass Tunnel[/url]: Just under the left side of the top platform. * [url=https://wiki.supermetroid.run/Post_Crocomire_Shaft]Post-Crocomire (i.e. pre-grapple) Shaft[/url]: right underneath the top ledge, like two blocks from the left wall. * [url=https://wiki.supermetroid.run/Early_Supers_Room]Early Supers Room[/url]: get the Supers then fall down the resulting hole. [/spoiler] Other bonuses/achievements I'm aware of: [spoiler] * Defeating each boss with no damage gives the "NO DAMAGE" bonus. One possible bonus per boss instance. * There's also a "NO DAMAGE" bonus for getting through [url=https://wiki.supermetroid.run/Tourian_Escape_Room_4]Tourian Escape Room 4[/url] (the biggest and most complicated Tourian escape room) without taking damage. Good freakin' luck getting it if you enter it from the right without morph ball, though, because of that one pirate that shoots you in the face right as you enter. * "SMOOTH": Getting the Morph Ball without falling all the way to the ground first. Easiest way to do this is to wall-jump off the right wall, but there is a way to do this that's slightly faster and doesn't involve spin-jumping; I dunno how it works though. Apparently there's another "SMOOTH" bonus for getting out of the Etecoon shaft's PB alcove without falling into the shaft, by using a mockball? * "JUSTCHECKING": They took out the power-bomb access to the left side of the Morph Ball room. But they left this as an easter egg. Requires regular Bomb or Power Bomb before you get Morph Ball, so then you can lay a bomb at that wall and "just check" whether there's anything beyond it. * "CLEANSER": Defeat all the enemies in a room. The two rooms I've found so far that this works in are [url=https://wiki.supermetroid.run/Climb]The Climb[/url] (i.e. the Metroid 1 escape shaft), and the [url=https://wiki.supermetroid.run/Thread_The_Needle_Room]Thread the Needle Room[/url]. * "ALCATRAZ": Do the [url=https://wiki.supermetroid.run/Parlor_and_Alcatraz]Alcatraz[/url] escape. * "YOLO": charge up a shinespark then shinespark into the next room. Of course, you have no idea what the next room will be. But that's exactly the point. * "JUST POINTS" or something like that: Go all the way to the right in [url=https://wiki.supermetroid.run/Below_Botwoon_Energy_Tank]Below Botwoon Energy Tank[/url]. * "SKY RIDER": ride the top Tripper at the very top of [url=https://wiki.supermetroid.run/West_Ocean]West Ocean[/url] to get that one Missile expansion. * "BLINDING": Defeat the Gadora in the [url=https://wiki.supermetroid.run/Kraid_Eye_Door_Room]pre-Kraid room[/url]. All other Gadoras seem to have been removed. * "LUXURY ITEM": Get the Spring Ball. * "THE LONG WAY": I [i]think[/i] this is for getting to what would be the door to Wave Beam, without using Grapple (i.e. wall-jumping off the right wall of the spike pit before it). Not sure. * "PENALTY": heading into the fight against Mother Brain with an improper equipment loadout. See the readme for details. * "SURVIVOR": Survive for 100 rooms. Ones I haven't seen at all but we can probably guess what they are: "BABY SKIP", "GREEN GATE GLITCH", "SHORT CHARGE", "QUICK KILL" (presumably referring to Kraid), "FAST PILLAR", and maybe "EARLY SUPER". [/spoiler] Other observations: * You are assumed to know how to wall jump, bomb jump, and quickmorph. This includes mid-air starting a bomb jump. Get used to getting out of these rooms without the normal tools: [spoiler][url=https://wiki.supermetroid.run/Post_Crocomire_Jump_Room]Post-Crocomire Jump Room[/url], [url=https://wiki.supermetroid.run/Crocomire_Escape]Crocomire Escape[/url], and [url=https://wiki.supermetroid.run/Plasma_Room]Plasma Room[/url]. (Fortunately, the [url=https://wiki.supermetroid.run/Red_Brinstar_Fireflea_Room]Red Brinstar Fireflea Room[/url] -- i.e. the Grapple Path to X-Ray -- seems to only be generated if you have either of those items, so you don't have to horizontal bomb-jump. )[/spoiler]* The [url=https://wiki.supermetroid.run/Kassiuz_Room]Plasma Climb[/url] is a giant pain, especially if you only have Power Beam. The reverse is easy as pie. * The Super in [url=https://wiki.supermetroid.run/Main_Street]Maridia's Main Street[/url] that's only accessible from [url=https://wiki.supermetroid.run/Mt._Everest]Mt. Everest[/url] has been moved over to Mt. Everest instead. (You still need Morph Ball to get to it.) * The [url=https://wiki.supermetroid.run/Botwoon_Energy_Tank_Room]Botwoon Energy Tank Room[/url] is doable without Gravity Suit. [spoiler]You'll need to quickmorph. Disabling Hi Jump Boots makes this easier. [/spoiler] Also, the sand pits no longer drop you anywhere else. * Pre-activation [url=https://wiki.supermetroid.run/Pit_Room]ruined old Mother Brain room[/url] (or "Pit Room" as they call it, which is admittedly a faster name) doesn't have the Missile expansion. Only the activated version does. * You can re-collect non-unique items like Missile, Super, and PB expansions, by simply ending up in the same room. (Obviously you can also re-collect time-limited items.) * X-Ray has been replaced by a Missile tank. * Crabs are among the most dangerous creatures you will ever encounter. Marine wildlife in general, actually. Do remember to keep a healthy respect for -- and a healthy distance from -- marine wildlife, whenever possible. Also, something I made using my friend's screenshot. Glad I found this thread. New here, but wanted to both contribute and request help. I’ve been dinking around with sort of a low-effort TAS of this ROM hack recently, and I wanted to see if I could pull off an “all achievements” movie. I’ve played SM Arcade for a few months now, and I have about half of the achievements in white. There are a few, however, that I have no earthly idea what they are. Below are the achievements that I’m aware of, the ones that I’m not so sure about are highlighted in red. I appreciate any and all help. 1. No damage (Kraid)—You have to forego the KQK, killing him in his second phase without taking damage. The rest of the “no dmg” achievements are self-explanatory. 3. No damage (Ridley)—Good luck with this one. 4. No damage (Draygon)—Gravity Suit is a godsend in this fight. 7. No damage (Crocomire)—This includes taking an acid bath when going to get the E-tank on the right of the room. Wait until Croc does his spoopy skeleton collapse animation before you collect it. 9. No damage (Golden Torizo)—Thanks to his crappy hitbox, it’s pretty much a popcorn boss. 12. No damage (Escape)—Get through Tourian escape room 4 without being gangbanged by space pirates. Ledge grabbing and moonfall are your friend. 14. Baby skip—Are you smarter than a killer metroid? 15. Unreachable—This is the first one that I have no clue about. 16. YOLO—Shinespark through a door and into the next room. Use with caution, especially in Arcade mode. I’ve died many a time due to chain damage. 17. Shine skip—Initiate a horizontal shinespark through either Gauntlet Entrance or Gauntlet E-tank room. It doesn’t matter which side of the room you start. 18. Dedicated—There’s an earthen platform in the upper West Ocean that you can use to IBJ up to the missile pack in the nose of that ridge (in 100% you use blue suit running speed or a relatively precise shinespark to get there). Congrats, you just earned 3000 points. However, having Space Jump upon entering this room results in not getting the achievement, regardless of how you IBJ. 19. Impressive—Again, no idea. Some of the criteria for getting these achievements are very precise. 20. Quick drop—Descend through the crumble blocks rapidly in the upper part of Crateria green space pirate shaft with the two missiles. Down-back using left-right, and you’ll clip through the blocks with ease. 21. Skilled—Don’t know what this one is either. I guess I’m not that skilled after all. 22. Early super—This trick only works when you enter from the left door, unfortunately. Since the rooms are randomized, you’re likely going to enter this room not expecting to mockball. This is fine, as long as you haven’t scrolled the screen far enough to the right to activate the doors that you would otherwise run under with Speed Booster. If you scrolled the screen too far to the right, the doors will activate and you will have missed out on the opportunity to get this achievement. If you haven’t activated the doors, jump up onto the platform that you would normally execute the mockball in the vanilla game and perform mockball like normal. Ideally, you’ll want to enter morph just a few pixels before the first crumble block, as soft morphing onto crumble blocks is risky. 23. Smooth—There are two ways I currently know of to get this one. The first is to execute the proper jump that lands you on the pillar right next to the Morph Ball pedestal (landing on the ground next to it like a rookie voids the achievement). The other way is to execute a mockball going either direction into the small orifice (chuckle) that leads to the power bomb alcove in the Etecoon room with the animals that “teach” you how to walljump. Somehow the developers of this ROM hack made them more annoying. I wish there were an achievement for nuking them with a power bomb. 24. Dangerous—Risk life and limb for an achievement that I don’t know how to get. 25. Cleanser—All lifeforms in the “Thread the Needle” room must die! 26. Up the shaft—It’s so difficult not to laugh while typing this. Initiate a shinespark up the following shafts: Spore Spawn Super, Climb, Post-Croc Shaft. 27. GGG—Most of the green gates in this ROM have been turned blue due to ammo constraints and possible softlocks, but if you are lucky enough to come across one from the other side and possess the proper skillset, you’re golden. From personal experience, it’s best not to waste your supers once you’ve gotten this achievement. Especially if your next room is a boss fight. Ask me how I know. 28. Penalty—I’ve only encountered this in Arcade mode. If you are blessed enough to enter the pre-Mother Brain room with an insufficient amount of ammo, you are penalized by losing an E-tank for a certain amount of missiles/supers that you lack. At least they’re nice enough to give you an achievement for it. 29. Hero shot—Self-explanatory. I have encountered problems with certain beam combos, and the console seems to be picky about your position when you fire the shot. I don’t have this down to a science yet. 30. Hyper beam—Legend has it you’re able to obtain the fabled Hyper Beam. If you have a seed written down in which you obtain this item, PLEASE LET ME KNOW! 31. Sky rider—Glenn Magnus Harvey described it above. 32. Spike spark (C)—Perform the double frame-perfect moves to obtain Spike Suit in Crocomire’s pad. It’ll probably be a few years before I’m able to do this on my own. Negates the “No Damage (C)” achievement. 33. Quick kill—Perform the KQK. I personally prefer the 2 missiles/3 supers strat, but in some seeds you may have less than 3 supers for the trick. It’s possible to get this achievement in other ways, such as 2 missiles/2 supers/more missiles and charged plasma beam. All that matters is that Kraid never reaches his second phase. Negates the “No Damage (K)” achievement. 34. Short charge—Git gud at short charging. The ROM has a few different areas in which you can get this. There is the short platform before the Spore Spawn super, among a few others that escape my memory for no good reason. 35. Just checking—Place a bomb (preferably NOT a power bomb, but hey, you use what you have) on the bottom left-hand corner of the Morph Ball room. Normally there would be a room with a power bomb pack further to the left, but the devs removed this room and instead gave you an achievement to remind you that there is no god. 36. Blinding—There’s a Gadora in the pre-Kraid room. It’s the only one that I know of in the ROM. Shoot it ‘til it dies. 37. Lava jump—You’ll probably lose a few good runs trying to execute this. 38. Flappy pillar—You only get this with Space jump and Screw Attack, which is a godsend in this room. 39. Fast pillar—Same as above, except with a horizontal shinespark. 40. Clipping—Not 100% sure about this one. I believe it relates to the clip you do in the upper part of the Wrecked Ship before going up into the Attic. 41. Grapple fly—Use Grapple Beam in Mount Everest to horizontally grapple jump over to the top right door. I may work the other way around, but I haven’t tried this. 43. Main street—Obtain the Main Street missiles in Maridia. The game doesn’t care if you have Gravity or not, as long as you’re able to shinespark into the missile pack. 46. QUADRUPLE!—Congratulations, you’ve successfully performed four consecutive grapple jumps. You’ve earned a banana sticker. 47. On a quest—I need help with this one. Nintendo Power has no clue either. 48. Ice clip—Perform the metroid ice clip in the pre-Botwoon room. If I remember right, it’s also possible to get this achievement by freezing one of the Puyos to get to the door leading to the vanilla Shacktool room. Don’t quote me on that. 49. Daring—Instead of power bombing the floor in the Fast Pillar Setup Room, enter the door on the top right. Try to not die from golden pirates. 50. Unfazed—No idea. Pls halp. 51. Just points—Make it to the other side of the room below the Botwoon E-tank (there’s no actual name for this room, so I’m going to call it the “Congrats, You Just Wasted 25 Seconds for a Dead End” room). 52. Break free—In this ROM, Gravity Suit is quite a luxury. That being said, If you’re in need of a reserve tank and two missiles, the West Sand Hole is your goal. You’ll need to figure out how to quickly walljump underwater. 53. Scraptool—This machine is awkward and inefficient at clearing out sand. Destroy it. 54. Plasma spark—A holy grail of a 100% item collection strat. You know what to do. Maybe. 55. Not plasma spark—Got this one completely by accident. Short charge at the bottom of Plasma Beam Room. Initiate shinespark to get to the top of the room. Why is this even an achievement? 57. Luxury item—Obtain the illustrious Springball. Having Gravity Suit and entering doors on the right of a room (wherever possible) significantly increases the chances of entering this room. 58. Collector—Obtain all four timed items—Plasma, Screw Attack, Gravity, and Space Jump—at once. 59. Survivor—Make it to 100 rooms in Arcade mode. And that’s what I have at the moment. I’ll try to keep this updated as I discover more things. Glad I found this thread. New here, but wanted to both contribute and request help. I’ve been dinking around with sort of a low-effort TAS of this ROM hack recently, and I wanted to see if I could pull off an “all achievements” movie. I’ve played SM Arcade for a few months now, and I have about half of the achievements in white. There are a few, however, that I have no earthly idea what they are. Below are the achievements that I’m aware of, the ones that I’m not so sure about are highlighted in red. I appreciate any and all help. NOTE: Spoilers here! If you don’t care about having to discover your own strats, click below: [hidden] 1. No damage (Kraid)—You have to forego the KQK, killing him in his second phase without taking damage. The rest of the “no dmg” achievements are self-explanatory. 2. No damage (Phantoon) 3. No damage (Ridley)—Good luck with this one. 4. No damage (Draygon)—Gravity Suit is a godsend in this fight. 5. No damage (Bomb Torizo) 6. No damage (Spore Spawn) 7. No damage (Crocomire)—This includes taking an acid bath when going to get the E-tank on the right of the room. Wait until Croc does his spoopy skeleton collapse animation before you collect it. 8. No damage (Botwoon) 9. No damage (Golden Torizo)—Thanks to his crappy hitbox, it’s pretty much a popcorn boss. 10. No damage (Motherbrain phase 1) 11. No damage (Motherbrain phase 2) 12. No damage (Escape)—Get through Tourian escape room 4 without being gangbanged by space pirates. Ledge grabbing and moonfall are your friend. 13. Alcatraz—Self-explanatory. 14. Baby skip—Are you smarter than a killer metroid? [color="red"]15. Unreachable—This is the first one that I have no clue about. [/color] 16. YOLO—Shinespark through a door and into the next room. Use with caution, especially in Arcade mode. I’ve died many a time due to chain damage. 17. Shine skip—Initiate a horizontal shinespark through either Gauntlet Entrance or Gauntlet E-tank room. It doesn’t matter which side of the room you start. 18. Dedicated—There’s an earthen platform in the upper West Ocean that you can use to IBJ up to the missile pack in the nose of that ridge (in 100% you use blue suit running speed or a relatively precise shinespark to get there). Congrats, you just earned 3000 points. However, having Space Jump upon entering this room results in not getting the achievement, regardless of how you IBJ. [color="red"]19. Impressive—Again, no idea. Some of the criteria for getting these achievements are very precise. [/color] 20. Quick drop—Descend through the crumble blocks rapidly in the upper part of Crateria green space pirate shaft with the two missiles. Down-back using left-right, and you’ll clip through the blocks with ease. [color="red"]21. Skilled—Don’t know what this one is either. I guess I’m not that skilled after all. [/color] 22. Early super—This trick only works when you enter from the left door, unfortunately. Since the rooms are randomized, you’re likely going to enter this room not expecting to mockball. This is fine, as long as you haven’t scrolled the screen far enough to the right to activate the doors that you would otherwise run under with Speed Booster. If you scrolled the screen too far to the right, the doors will activate and you will have missed out on the opportunity to get this achievement. If you haven’t activated the doors, jump up onto the platform that you would normally execute the mockball in the vanilla game and perform mockball like normal. Ideally, you’ll want to enter morph just a few pixels before the first crumble block, as soft morphing onto crumble blocks is risky. 23. Smooth—There are two ways I currently know of to get this one. The first is to execute the proper jump that lands you on the pillar right next to the Morph Ball pedestal (landing on the ground next to it like a rookie voids the achievement). The other way is to execute a mockball going either direction into the small orifice (chuckle) that leads to the power bomb alcove in the Etecoon room with the animals that “teach” you how to walljump. Somehow the developers of this ROM hack made them more annoying. I wish there were an achievement for nuking them with a power bomb. [color="red"]24. Dangerous—Risk life and limb for an achievement that I don’t know how to get. [/color] 25. Cleanser—All lifeforms in the “Thread the Needle” room must die! 26. Up the shaft—It’s so difficult not to laugh while typing this. Initiate a shinespark up the following shafts: Spore Spawn Super, Climb, Post-Croc Shaft. 27. GGG—Most of the green gates in this ROM have been turned blue due to ammo constraints and possible softlocks, but if you are lucky enough to come across one from the other side and possess the proper skillset, you’re golden. From personal experience, it’s best not to waste your supers once you’ve gotten this achievement. Especially if your next room is a boss fight. Ask me how I know. 28. Penalty—I’ve only encountered this in Arcade mode. If you are blessed enough to enter the pre-Mother Brain room with an insufficient amount of ammo, you are penalized by losing an E-tank for a certain amount of missiles/supers that you lack. At least they’re nice enough to give you an achievement for it. 29. Hero shot—Self-explanatory. I have encountered problems with certain beam combos, and the console seems to be picky about your position when you fire the shot. I don’t have this down to a science yet. 30. Hyper beam—Legend has it you’re able to obtain the fabled Hyper Beam. If you have a seed written down in which you obtain this item, PLEASE LET ME KNOW! 31. Sky rider—Glenn Magnus Harvey described it above. 32. Spike spark (C)—Perform the double frame-perfect moves to obtain Spike Suit in Crocomire’s pad. It’ll probably be a few years before I’m able to do this on my own. Negates the “No Damage (C)” achievement. 33. Quick kill—Perform the KQK. I personally prefer the 2 missiles/3 supers strat, but in some seeds you may have less than 3 supers for the trick. It’s possible to get this achievement in other ways, such as 2 missiles/2 supers/more missiles and charged plasma beam. All that matters is that Kraid never reaches his second phase. Negates the “No Damage (K)” achievement. 34. Short charge—Git gud at short charging. The ROM has a few different areas in which you can get this. There is the short platform before the Spore Spawn super, among a few others that escape my memory for no good reason. 35. Just checking—Place a bomb (preferably NOT a power bomb, but hey, you use what you have) on the bottom left-hand corner of the Morph Ball room. Normally there would be a room with a power bomb pack further to the left, but the devs removed this room and instead gave you an achievement to remind you that there is no god. 36. Blinding—There’s a Gadora in the pre-Kraid room. It’s the only one that I know of in the ROM. Shoot it ‘til it dies. 37. Lava jump—You’ll probably lose a few good runs trying to execute this. 38. Flappy pillar—You only get this with Space jump and Screw Attack, which is a godsend in this room. 39. Fast pillar—Same as above, except with a horizontal shinespark. [color="yellow"]40. Clipping—Not 100% sure about this one. I believe it relates to the clip you do in the upper part of the Wrecked Ship before going up into the Attic. [/color] 41. Grapple fly—Use Grapple Beam in Mount Everest to horizontally grapple jump over to the top right door. I may work the other way around, but I haven’t tried this. 42. Grapple jump—Self-explanatory. 43. Main street—Obtain the Main Street missiles in Maridia. The game doesn’t care if you have Gravity or not, as long as you’re able to shinespark into the missile pack. 44. DOUBLE!—Double Grapple jump. 45. TRIPLE!—You’ll never guess. 46. QUADRUPLE!—Congratulations, you’ve successfully performed four consecutive grapple jumps. You’ve earned a banana sticker. [color="red"]47. On a quest—I need help with this one. Nintendo Power has no clue either. [/color] 48. Ice clip—Perform the metroid ice clip in the pre-Botwoon room. If I remember right, it’s also possible to get this achievement by freezing one of the Puyos to get to the door leading to the vanilla Shacktool room. Don’t quote me on that. 49. Daring—Instead of power bombing the floor in the Fast Pillar Setup Room, enter the door on the top right. Try to not die from golden pirates. [color="red"]50. Unfazed—No idea. Pls halp. [/color] 51. Just points—Make it to the other side of the room below the Botwoon E-tank (there’s no actual name for this room, so I’m going to call it the “Congrats, You Just Wasted 25 Seconds for a Dead End” room). 52. Break free—In this ROM, Gravity Suit is quite a luxury. That being said, If you’re in need of a reserve tank and two missiles, the West Sand Hole is your goal. You’ll need to figure out how to quickly walljump underwater. 53. Scraptool—This machine is awkward and inefficient at clearing out sand. Destroy it. 54. Plasma spark—A holy grail of a 100% item collection strat. You know what to do. Maybe. 55. Not plasma spark—Got this one completely by accident. Short charge at the bottom of Plasma Beam Room. Initiate shinespark to get to the top of the room. Why is this even an achievement? 56. Pitless—Another self-explanatory strat. 57. Luxury item—Obtain the illustrious Springball. Having Gravity Suit and entering doors on the right of a room (wherever possible) significantly increases the chances of entering this room. 58. Collector—Obtain all four timed items—Plasma, Screw Attack, Gravity, and Space Jump—at once. 59. Survivor—Make it to 100 rooms in Arcade mode. [/hidden] And that’s what I have at the moment. I’ll try to keep this updated as I discover more things. Whoa, awesome. Thanks for this list! Also possible in the Crateria/Tourian escape shaft. "Below Botwoon Energy Tank" room. Thanks to Arcade, I guess we could rename it the Just Points room or something else. "All the Way"? "Swim Cave"?